This global annual market overview will provide you with an in-depth review of the key issues in the global carbonated soft drinks market through 2014 as well as our forecast for what will happen in 2015 and beyond. Carbonated soft drinks (CSDs) continued to be one of the most challenging drink segments in 2014, thanks to unrelenting pressure caused by obesity and sugar concerns. 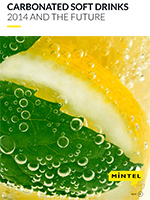 The pressure on the soft drink industry is no longer limited to mature CSD markets such as the United States, but now includes countries such as Mexico and Brazil. Some countries have managed growth, however, despite the current climate. Germany, for example, has managed to eke out volume growth in recent years, while many of its European neighbors have seen declines. Canada, too, has managed volume growth in CSDs. In Canada, however, consumers are showing an increasing preference for flavors. Products such as Dr Pepper Snapple’s new Schweppes Dark Ginger Ale take advantage of that trend, promising a “darker, richer flavour” than traditional ginger ale. The fastest-growing markets for CSDs, however, continue to be in developing regions, particularly in Asia Pacific. India has been the strongest country in both volume and value sales. Vietnam and China too saw significant increases in both volume and value sales during that period.